Why are more people avoiding gluten? 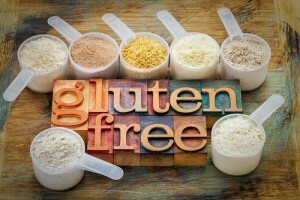 Gluten has become a common intolerance or sensitivity, there are both mild and more severe cases. The most severe is with those who suffer from Celiac Disease and mild intolerances include those who have a sensitivity. Some deem avoiding gluten as a fad or trend and unnecessary, unfortunately with the quality of our food and farming gluten intolerance has become a major concern. There are three levels of gluten health concerns, the first and most serious is Celiac Disease, then a gluten intolerance/ wheat allergy and finally gluten sensitivity, which is the most common among mainstream health enthusisist. Gluten due to the chemicals that wheat is processed with in modern farming practices has created an inflammatory effect when the metabolism tries to process the gluten and the chemicals it now comes with. The potency of herbicides applied to wheat has increased by 47% since 1998, this is creating a very toxic food that is only going to become more potent due to the way the herbicides germinate. Experts believe that the low nutrient over processed broken down wheat in our mainstream cooking flour has caused us to become intolerant to gluten, resulting from compromised gut function. The gut and gastrointestinal system is the body’s dashboard for good health, containing healthy bacteria that help keep unhealthy bacteria levels at bay. When the gut becomes compromised due to over exposure to antibiotics, food intolerances and other common toxins, the physical lining of the gut becomes worn, lowering healthy bacteria levels, reducing our body’s ability to absorb key nutrients, resulting in malnourishment and a compromised immune system, with a constant state of inflammation. A wheat allergy is an immune response to any of the proteins present in wheat, including but not limited to gluten. It’s most common in children. Around 65 percent of children with a wheat allergy outgrow it by the age of 12. Symptoms related to a wheat allergy will usually begin within minutes of consuming the wheat. However, they can begin up to two hours after. The symptoms of a wheat allergy can range from mild to life-threatening. Severe difficulty breathing, known as anaphylaxis, can sometimes occur. Your doctor will likely prescribe an epinephrine auto-injector (such as an EpiPen) if you’re diagnosed with a wheat allergy. You can use this to prevent anaphylaxis if you accidentally eat wheat. There is increasing evidence for a gluten-related condition that causes symptoms in people who don’t have celiac disease and are not allergic to wheat. Researchers are still trying to discover the exact biological cause of this condition, known as NCGS. There’s no test that can diagnose you with NCGS. The best option is to eliminate it from your diet completely for 2-4 weeks and reintroduce it to see if you feel any symptoms. It’s diagnosed in people who experience symptoms after eating gluten but test negative for wheat allergy and celiac disease. As more and more people go to their doctor reporting unpleasant symptoms after eating gluten, researchers are trying to characterize these conditions so that NCGS can be better understood. Because no laboratory test exists for NCGS, your doctor will want to establish a clear connection between your symptoms and your consumption of gluten to diagnose you with NCGS. They may ask you to keep a food and symptom journal to determine that gluten is the cause of your problems. After the cause is established and your tests come back normal for wheat allergy and celiac disease, your doctor may advise you to begin a gluten-free diet. There is a correlation between autoimmune disorders and gluten sensitivity. Research has also revealed that gluten sensitivity like sugar has a similar increased opiate receptor activity. The brain tissue in mice revealed an increase in opiate response specifically when gluten was consumed. Even gluten free processed carbohydrates can stimulate the opiate receptor response, corn tortillas, gluten free cookies, breads, etc. Some gluten free substitutions are loaded with simple carbohydrates and syrups to offset the different taste compared to its gluten containing common food, but provide some of the negative metabolic effects. Strive to consume grains from naturally gluten free sources like long grain wild rice, quinoa, sweet potatoes, and steel cut oats. Eliminating processed sugar, and processed flours and preservatives that contain gluten will have a significant effect on helping people improve quality of life while reducing inflammation. Adopting a gluten free lifestyle is not as hard as it may seem. First start out by eliminating processed foods and building your meals around high quality all natural proteins from, meat, poultry, and seafood accompanied by all natural vegetables and fruits. The most popular gluten free diet is Paleo, this is also referred to as a “caveman” diet, individuals who follow this diet eat mainly protein, vegetables, fruits, and healthy fats in their most natural state. All animal protein that have not been marinated are naturally gluten free, it goes for vegetables that have not been processed with sauces or marinades. Building a healthy nutrition plan around protein, heart health fats from oil, avocados, nuts, seeds, in addition to 9-11 servings of fruits and vegetables daily is the best way to eliminate gluten from your diet. A ratio of 3 servings of vegetables to 1 serving of fruit is best to avoid excessive sugar even if it’s in its natural form. It is not necessary to purchase expensive gluten free boxed snack foods they are still high in processed ingredients and sugar, stick to the basics of protein, vegetables and fruits.